IFN-γ is critical for the protection against intracellular bacteria through activation of the antimicrobial machinery of phagocytes. Coxiella burnetii, the etiological agent of Q fever, is a strictly intracellular bacterium that inhabits monocytes/macrophages. We previously showed that IFN-γ induced C. burnetii killing by promoting the apoptosis of infected monocytes. We show in this study that IFN-γ-induced apoptosis of infected monocytes was characterized by a time- and dose-dependent activation of caspase-3. IFN-γ-mediated caspase-3 activation and C. burnetii killing depend on the expression of membrane TNF. Indeed, TNF was transiently expressed on the cell surface of infected monocytes a few hours after IFN-γ treatment. In addition, anti-TNF Abs inhibited IFN-γ-mediated caspase-3 activation whereas soluble TNF had no effect on infected cells. Concomitantly, IFN-γ induced homotypic adherence of C. burnetii-infected monocytes. The latter required the interaction of β2 integrins with CD54. When adherence was disrupted by pipetting, by a combination of Abs specific for CD11b, CD18, and CD54, or by an antisense oligonucleotide targeting CD18 mRNA, both cell apoptosis and bacterial killing induced by IFN-γ were inhibited. Thus, adherence via CD54/β2 integrins together with membrane TNF are required to eliminate C. burnetii-infected cells through cell contact-dependent apoptosis. Our results reveal a new component of the antimicrobial arsenal mobilized by IFN-γ against infection by intracellular bacteria. Coxiella burnetii, the agent of Q fever, is a strictly intracellular bacterium residing in monocytes/macrophages (1). The natural history of Q fever is characterized by the development of a primary infection that may be symptomatic. In most of these patients the acute Q fever resolves without specific antibiotic treatment. In patients with depressed cell-mediated immune response, the primary infection may evolve to a chronic infection (2). In addition, patients with chronic Q fever exhibit impaired granuloma formation and lymphoproliferation, and a monocyte microbicidal defect associated with alteration of the cytokine network (2, 3, 4). Antibiotic treatment is long-lasting and does not protect against the occurrence of relapses (1). Indeed, strategies designed to restore microbicidal competence may be critical for Q fever treatment (5). Although IFN-γ is a well-known inducer of antimicrobial properties of monocytes/macrophages, the mechanisms of IFN-γ-mediated microbicidal activation of macrophages remain elusive. Microbicidal effects of IFN-γ are related to the production of reactive oxygen and nitrogen intermediates (6). IFN-γ also inhibits the intracellular replication of bacteria by limiting the availability of iron (7). In addition, IFN-γ primes macrophages to produce cytokines such as TNF that, in turn, activates macrophages to kill pathogens (8). We previously demonstrated that the treatment by IFN-γ of C. burnetii-infected monocytes induced cell apoptosis and bacterial killing (9). The role of apoptosis in host resistance toward infection is controversial. Indeed, intracellular bacteria may interfere directly with the apoptotic process either to eliminate harmful cells or to increase the life span of their host cells (10). For example, the caspase cascade is either activated (11, 12) or inhibited (13) during infection, resulting respectively in pro- or antiapoptotic effects. Furthermore, the activation of the survival factor NF-κB is prevented by Yersinia enterocolitica (14) but promoted by Rickettsia rickettsii (15). Brucella suis infection up-regulates the expression of an antiapoptotic protein belonging to the Bcl-2 family (16). The benefic role of apoptosis in infections caused by intracellular organisms is based on elimination of the bacteria (17), efficient Ag presentation (18), and limitation of the inflammatory response (19). Unlike other intracellular pathogens, C. burnetii does not affect the viability of infected cells and only IFN-γ-induced cell apoptosis results in bacterial death (9). Interestingly, IFN-γ is locally produced in granulomas in which the apoptosis of infected macrophages could contribute to the protective role of IFN-γ (20). This is supported by the lack of granuloma formation in patients with inherited IFN-γ receptor deficiency who are highly susceptible to infections caused by intracellular bacteria (21). In this paper, we show that IFN-γ-induced apoptosis of C. burnetii-infected THP-1 monocytes and bacterial killing require both membrane TNF (mTNF)3 and homotypic adherence of monocytes. This latter occurs through the engagement of β2 integrins. Thus, IFN-γ exerts its bactericidal activity against C. burnetii via a novel mechanism involving cell contact-dependent apoptosis of infected monocytes. Human myelomonocytic cell line THP-1 was provided by the European Collection of Animal Cell Cultures (Sophia Antipolis, France). Cells were propagated in suspension at an initial density of 5 × 105 cells/ml in RPMI 1640 containing 25 mM HEPES, 10% FBS, 2 mM l-glutamine, 100 U/ml penicillin, and 100 μg/ml streptomycin (Invitrogen, Eragny, France) by biweekly passages. The cell viability was assessed by trypan blue exclusion. C. burnetii organisms (VR-615, Nine Mile strain; American Type Culture Collection, Manassas, VA) were obtained as previously described (22). Bacteria were injected into mice and were recovered from spleens 10 days later. They were then cultured for up to five passages in mouse L929 fibroblasts. After 1 wk, infected cells were sonicated and bacteria were purified on a 25–45% Renografin gradient. Purified bacteria were suspended in HBSS before being stored at −80°C. The number of bacteria was determined by Gimenez staining, and their viability was assessed using the LIVE/DEAD BacLight bacterial viability kit as recommended by the manufacturer (Molecular Probes, Eugene, OR). Only preparations containing >90% of viable bacteria were used to infect THP-1 monocytes according to our published procedure (9). Briefly, monocytes (5 × 105 cells/ml) were incubated with C. burnetii (bacterium-to-cell ratio of 200:1) for 24 h at 37°C: ∼70% of cells were infected with three or four bacteria per cell in these conditions. After removal of free bacteria by low speed centrifugation (corresponding to time, t = 0 h), cells were treated by cytokines (recombinant human IFN-γ or TNF; R&D Systems, Abingdon, U.K.) together with Abs (blocking goat anti-TNF Ab, anti-TNFR type I and type II mAbs, and anti-CD11b Ab; R&D Systems), or mouse mAbs directed against CD18 and CD54 (Immunotech, Roissy, France) for different periods of time. C. burnetii organisms were revealed by Gimenez staining of cytocentrifuged cells and the infection index was calculated as follows: mean number of bacteria per infected cell × percentage of infected cells × 100. This value corresponds to the number of bacteria phagocytosed by 100 cells. As the number of monocytes increased during the experiment, the infection index was expressed relative to the number of monocytes at t = 0 h. The viability of intracellular C. burnetii was determined using the LIVE/DEAD BacLight bacterial viability kit. Infected monocytes were lyzed in distilled water by 1-min agitation and centrifuged at low speed to eliminate cell debris. The supernatant containing free bacteria was centrifuged at 8,000 × g for 10 min. The bacterial pellet was washed again in water and the percentage of viable organisms was determined. Caspase-3 activity was measured as described elsewhere (23). THP-1 monocytes (4 × 105) were lyzed in 100 μl of a buffer consisting in 10 mM HEPES, 42 mM KCl, 5 mM MgCl2, 1 mM DTT, 0.5% 3-[(3-cholamidopropyl)dimethylammonio]-1-propanesulfonate, 1 mM PMSF, and 1 μg/ml leupeptin (Sigma-Aldrich, St. Louis, MO). Cell lysates (25 μl) were incubated with 75 μl of a buffer (25 mM HEPES, 1 mM EDTA, 0.1% 3-[(3-cholamidopropyl)dimethylammonio]-1-propanesulfonate, 10% sucrose, 3 mM DTT, pH 7.5) containing 30 μM of the fluorogenic caspase substrate Ac-DEVD-AMC (Calbiochem, France Biochem, Meudon, France) for 1 h at 37°C. Fluorescence (excitation 360 nm; emission 460 nm) was measured in a microplate fluorescence reader FL600 (Fisher Scientific, Elancourt, France). Results were expressed as caspase-3 activity calculated as follows: fluorescence intensity (in arbitrary units) measured in the presence of Ac-DEVD-AMC minus background fluorescence intensity measured in the presence of Ac-DEVD-AMC and the caspase-3 inhibitor Ac-DEVD-CHO (10 μM; Calbiochem). After cytocentrifugation, infected THP-1 monocytes (3 × 104 cells per assay) were first incubated with PBS containing 0.1% horse serum (Invitrogen) and then with 10 μg/ml anti-TNF mouse Ab (mouse IgG1, clone BC7, kindly provided by Dr G. E. Grau, Faculté de Pharmacie, Marseille, France) for 30 min at 4°C. After washing, cells were labeled with FITC-conjugated F(ab′)2 directed against mouse IgG (4 μg/ml; Immunotech) for 30 min at 4°C. Cells were fixed 10 min with 1% formaldehyde, mounted in Mowiol (Calbiochem), dried, and observed with a fluorescence microscope. THP-1 monocytes (2.5 × 104 cells per well) cultured in 96-well plates were observed by phase contrast microscopy. At least three fields, containing 100 cells or more, were counted and the percentage of clustered cells was calculated as follows: (1 − number of single cells/total number of cells) × 100. In some experiments, cell clusters were disrupted by calibrated pipetting (24). The complete dissociation of clusters was confirmed by observation with an inverted microscope. This procedure was repeated three times a day after adding IFN-γ to infected monocytes. The mAbs specific for cell surface molecules were purchased from Immunotech (CD11a, CD11b, CD11c, CD18, CD54, and isotypic controls) and R&D Systems (TNFR1, TNFR2, and isotypic controls). THP-1 monocytes were incubated with mAbs (10 μg/ml) in RPMI 1640 containing 40 μg/ml human IgG and 5% goat serum for 30 min at 4°C. After washing, they were incubated with FITC-conjugated F(ab′)2 anti-mouse IgG (4 μg/ml) for 30 min at 4°C. Monocytes were then fixed with 1% formaldehyde. The cell fluorescence was analyzed by an EPICS XL flow cytometer (Coulter, Hialeah, FL). Live cells were gated using forward and side scatters and the fluorescence of 104 cells was recorded (log scale) and expressed as mean fluorescence intensity (MFI). Sequences of phosphorothioate antisense oligonucleotide targeting CD18 mRNA (AS18) and those of control oligonucleotides (S18, sense oligonucleotide; RS18, random oligonucleotide) were published elsewhere (25). Infected monocytes (2 × 106 cells per assay) were incubated with 2.5% trypsin/EDTA for 5 min at 37°C and washed before treatment with antisense oligonucleotides (10 μM) and lipofectin (10 μg/ml; Invitrogen). After a 4-h incubation at 37°C, monocytes were cultured in antibiotic-free RPMI 1640 containing 10% FBS. Results are given as the mean ± SD and compared with the Student’s t test. Differences were considered significant when p < 0.05. In a first series of experiments, the extent of monocyte apoptosis was quantified using caspase-3 activity measurement because caspase-3 initiates the final execution stages leading to DNA fragmentation (26) and chromatin condensation (27), two features of IFN-γ-induced apoptosis of C. burnetii-infected monocytes (9). In noninfected monocytes, caspase-3 activity was low whatever the concentration of IFN-γ used (Fig. 1⇓A) and was equivalent to caspase-3 activity of infected cells in the absence of IFN-γ (Fig. 1⇓B). 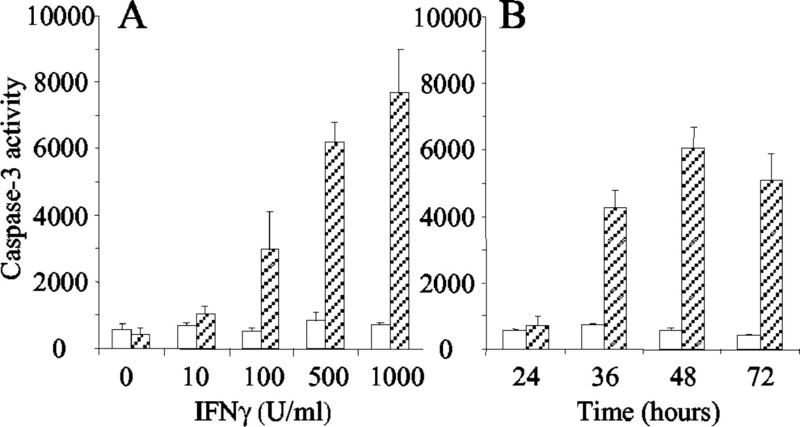 In C. burnetii-infected cells treated with IFN-γ for 48 h, the caspase-3 activity was detectable for an IFN-γ concentration of 100 U/ml (3000 ± 1190 arbitrary fluorescence units) and was increased with IFN-γ concentrations (7750 ± 1320 arbitrary units for 1000 U/ml IFN-γ). IFN-γ-mediated caspase-3 activation was also time-dependent (Fig. 1⇓B). In the presence of IFN-γ (500 U/ml), the caspase-3 activity was detected at 36 h (4380 ± 530 arbitrary units) and peaked after 48 h (6210 ± 630 arbitrary units). Hence, IFN-γ induced caspase-3 activation only in C. burnetii-infected monocytes. Caspase-3 activity in C. burnetii-infected monocytes. Caspase-3 activity was measured in cell lysates using the fluorogenic substrate Ac-DEVD-AMC. A, Monocytes infected (▨) or not infected (□) with C. burnetii were treated with increasing doses of IFN-γ for 48 h. B, Infected monocytes were treated (▨) or not treated (□) with IFN-γ (500 U/ml) for different periods of time. Results are expressed in arbitrary fluorescence units and represent the mean ± SD of four experiments. IFN-γ-mediated caspase-3 activation was partially dependent on TNF (Table I⇓). Anti-TNF Ab (5 μg/ml) significantly reduced (p < 0.05) the caspase-3 activity (46% inhibition) in C. burnetii-infected monocytes treated by IFN-γ for 48 h. The role of TNFR in caspase-3 activation was also studied. First, C. burnetii-infected monocytes expressed both TNFR, TNFR1 being expressed at a lower level than TNFR2 (Fig. 2⇓). The treatment of infected monocytes by IFN-γ for 4 h had no effect on the expression of both TNFR. TNFR1 and TNFR2 were only down-regulated after 24 h of IFN-γ treatment (Fig. 2⇓). Second, the blockade of TNFR1 or TNFR2 by specific Abs resulted in a slight inhibition of caspase-3 activity (14 and 20%, respectively). Combining both anti-TNFR Abs led to a 43% inhibition of caspase-3 activity (p < 0.05). Determination of TNFR. 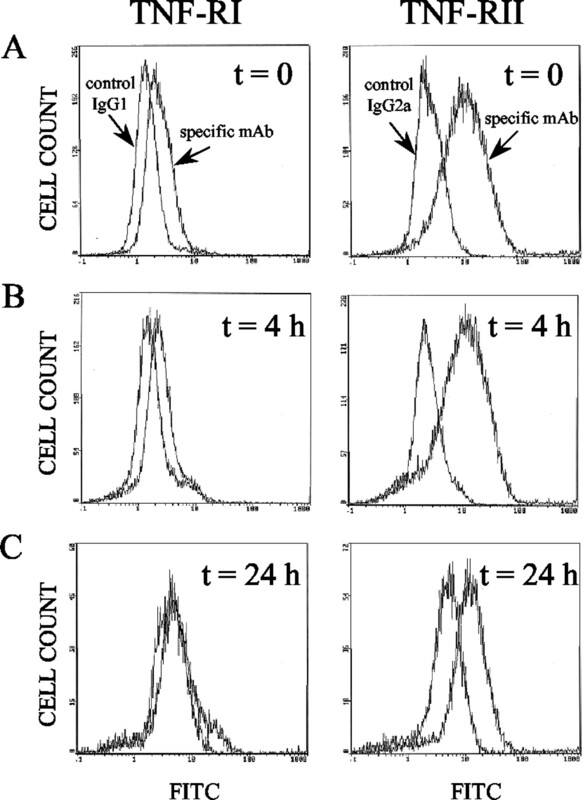 Monocytes were infected with C. burnetii for 24 h (A) and then treated with IFN-γ (500 U/ml) for 4 h (B) and 24 h (C). After washing, monocytes were incubated with mAbs toward TNFR1, TNFR2, or isotypic IgG, and FITC-conjugated F(ab′)2 anti-mouse IgG. The cells were analyzed by flow cytometry. One representative experiment of three is shown. As anti-TNF and anti-TNFR Abs also inhibit cell death induced by IFN-γ (9), it is likely that IFN-γ induces monocyte apoptosis through TNF. Consequently, we investigated the ability of soluble TNF to mimic the IFN-γ effect on infected monocytes. Soluble TNF at 200 pg/ml, a concentration similar to that measured in supernatants of C. burnetii-infected monocytes after 24 h of IFN-γ treatment (9), did not affect monocyte viability. A concentration as high as 2000 pg/ml TNF had no effect on monocyte viability whereas IFN-γ dramatically decreased monocyte viability (Fig. 3⇓). Soluble TNF (200 and 2000 pg/ml) also did not induce caspase-3 activity (data not shown). Effect of soluble TNF on monocyte viability. Monocytes were infected with C. burnetii for 24 h (designated 0 h). They were then cultured in the presence of IFN-γ or TNF for different periods of time. The percentage of viable monocytes was determined every 24 h using trypan blue exclusion. The results represent the mean ± SD of four experiments. Because soluble TNF could not mimic IFN-γ-induced apoptosis of C. burnetii-infected monocytes, we investigated the expression of mTNF. TNF was not expressed on the surface of infected monocytes (Fig. 4⇓A). In contrast, mTNF became detectable 2 h after the addition of IFN-γ (5 ± 4% of positive cells) and after 4 h, 71 ± 7% of infected monocytes expressed mTNF, which was uniformly distributed on the cell surface or was present as patches (Fig. 4⇓B). Isotypic-matched Ab gave no staining (data not shown). The membrane expression of TNF was transient: only 46 ± 7% of infected monocytes treated by IFN-γ expressed mTNF after 6 h (Fig. 4⇓C), and mTNF was undetectable after 8 h of incubation with IFN-γ (Fig. 4⇓D). Thus, IFN-γ-mediated caspase-3 activation and cell death are associated with the transient expression of mTNF by C. burnetii-infected cells. IFN-γ-induced membrane expression of TNF. Infected monocytes were treated with IFN-γ (500 U/ml) for different periods of time. They were then incubated with anti-TNF mAb, and cell-associated TNF was revealed with FITC-conjugated F(ab′)2 directed against mouse IgG. The distribution of fluorescence was observed by fluorescence microscopy. A, Untreated monocytes; B–D, monocytes treated with IFN-γ for 4, 6, and 8 h, respectively. It is likely that surface phenomena, such as adherence of infected monocytes, increases the likelihood of encounter between mTNF and its membrane receptors. Thus, we investigated the relationship between apoptosis and cell adherence. In the absence of IFN-γ, <10% of monocytes were clustered after 24 h of incubation (Fig. 5⇓). This percentage increased to ∼20% in C. burnetii-infected monocytes. IFN-γ (500 U/ml) increased the percentage of clustered monocytes: the formation of clusters occurred more rapidly in infected monocytes than in noninfected cells (15 ± 2% vs 7 ± 3% after 2 h) and the plateau value at 24 h was higher in infected cells than in noninfected cells (49 ± 4% vs 36 ± 4%, p <0.05). In addition, clusters were larger in infected monocytes than in noninfected cells (data not shown). Hence, IFN-γ stimulated homotypic adherence of monocytes, which was enhanced by C. burnetii infection. IFN-γ-induced homotypic adherence of infected monocytes. Monocytes infected or not infected by C. burnetii were cultured in the presence and the absence of IFN-γ (500 U/ml). Cells were counted as described in Materials and Methods and the kinetics of monocyte clustering is shown. The results represent the mean ± SD of three experiments. We next wondered whether homotypic adherence of infected monocytes played a role in IFN-γ-induced cell apoptosis. To assess this, we mechanically dissociated cell clusters (Fig. 6⇓A). Such treatment significantly reduced the caspase-3 activity in infected monocytes treated by IFN-γ, up to 51% inhibition after 48 h of IFN-γ treatment (p < 0.01) and 35% after 72 h (p < 0.05). In addition, cell mortality was decreased by the disruption of homotypic adherence. Dissociating cell clusters during either day 1 or 2 after IFN-γ treatment reduced the mortality of infected cells: 28 ± 6% (p < 0.01) and 32 ± 7% (p < 0.05), respectively vs 45 ± 2% for nondissociated monocytes (Fig. 6⇓B). When the mechanical dissociation of cell clusters was performed during the first 2 days, only 17 ± 1% of infected cells died after 3 days of IFN-γ treatment (p < 0.01 compared with undissociated cells). In the above experiments, a complete recovery of cell clusters was observed 4 to 6 h after their disruption by pipetting (data not shown). Such a reaggregation might explain the incomplete effect of the disruption of homotypic adherence on caspase-3 activity and cell death. Taken together, these results clearly demonstrate that IFN-γ-stimulated cell apoptosis requires homotypic adherence of infected monocytes. Effect of cluster dissociation on cell apoptosis and cell death. Infected monocytes were treated with IFN-γ (500 U/ml) for 3 days. 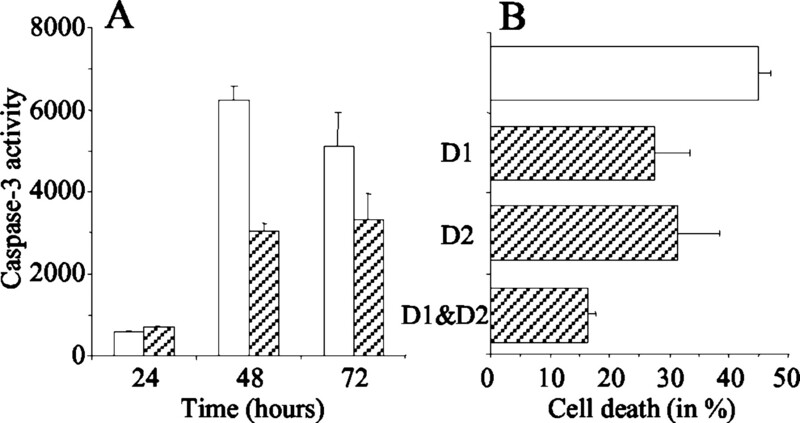 A, Cells were left unmanipulated (□) or cell clusters were disrupted by calibrated pipetting (▨), and caspase-3 activity was measured with the fluorogenic substrate Ac-DEVD-AMC every 24 h. B, Cell clusters were disrupted during day 1 (D1), day 2 (D2), or day 1 + day 2 (D1&D2) or left unmanipulated (□). On day 3, cell viability was assessed by trypan blue exclusion. The results are the mean ± SD from four experiments. β2 integrins are important mediators of cell-cell adherence (28). To test their role in IFN-γ-induced clustering, we chelated divalent cations by 1 mM EDTA or lowered the temperature to 4°C. This prevented the homotypic adherence of IFN-γ-treated monocytes (data not shown). Consequently, we investigated the membrane expression of monocyte integrins after 24 h of IFN-γ treatment (when the percentage of clustered cells was maximal, see Fig. 5⇑). The expression of CD18, the common chain of β2 integrins, and CD11a, CD11b and CD11c, the α-chains of β2 integrins was not affected by C. burnetii infection nor by the treatment of infected monocytes by 500 U/ml IFN-γ (data not shown). We also studied the expression of CD54, a member of the Ig superfamily known to bind β2 integrins (28). Labeling with isotypic control Ab resulted in MFI ranging from 10 to 22 in the absence or in the presence of IFN-γ, respectively. IFN-γ (500 U/ml) induced a moderate increase of the membrane expression of CD54 in noninfected monocytes (MFI of 19 in the absence of IFN-γ vs 96 in the presence of IFN-γ) and dramatically increased CD54 expression in C. burnetii-infected monocytes because MFI increased from 56 to 390 upon IFN-γ treatment. To study the role of β2 integrins in cell apoptosis, we blocked the interaction between CD11b/CD18 and CD54 with Abs or antisense oligonucleotides (Table II⇓). Incubating infected monocytes with IFN-γ (500 U/ml) in the presence of anti-CD11b, anti-CD18, and anti-CD54 Abs decreased the caspase-3 activity by 60% and restored monocyte viability. This combination of Abs also impaired cell clustering, leading to <15% of clustered cells compared with ∼60% in the presence of matched isotypic IgG. To further demonstrate the role of β2 integrins in cell apoptosis, we used a phosphorothioate oligonucleotide antisense directed against CD18 (AS18). In infected cells treated by IFN-γ, AS18 decreased caspase-3 activity by >60% as compared with cells incubated with control antisenses. AS18 also affected cell viability. Indeed, after 72 h of IFN-γ treatment, the cell viability increased from ∼47% in the presence of control antisenses to 75 ± 16% in the presence of AS18. 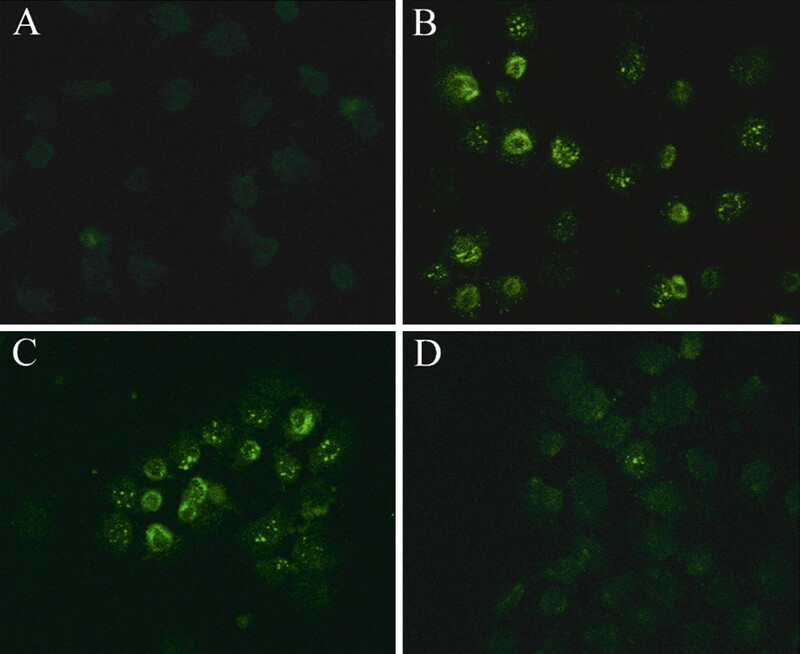 Taken together, these experiments show that β2 integrins are involved in IFN-γ-induced cell apoptosis. Because the IFN-γ treatment of C. burnetii-infected monocytes results in bacterial killing (9), we investigated the role of mTNF and homotypic adherence in C. burnetii killing. Soluble TNF at 200 pg/ml did not alter bacterial growth (Fig. 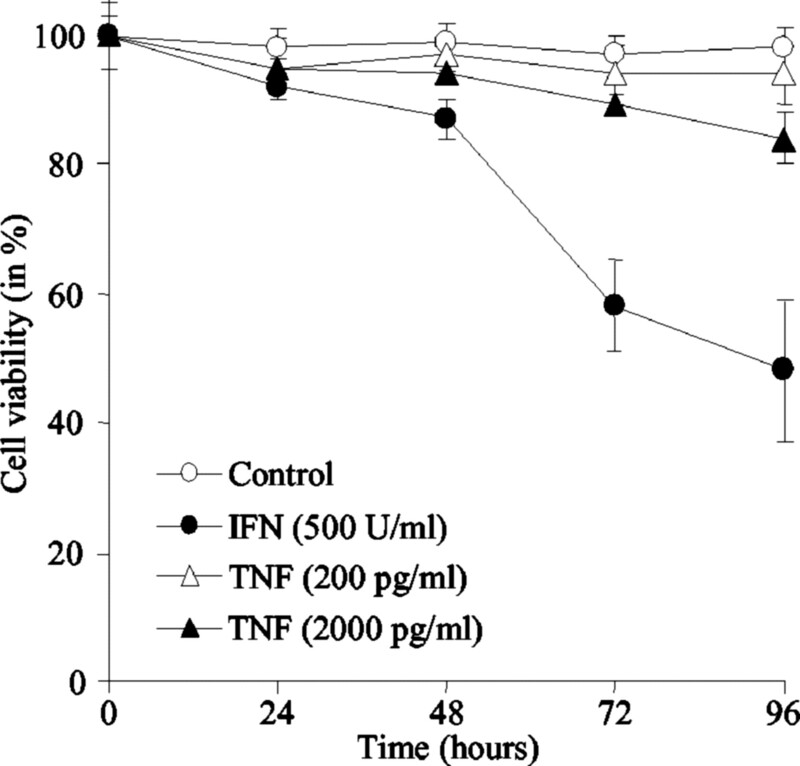 7⇓A) whereas anti-TNF and anti-TNFR Abs reduced the bactericidal activity of IFN-γ (9). When TNF was used at 2000 pg/ml, C. burnetii replication was only transiently delayed without effect on bacterial viability (Fig. 7⇓B). In contrast, IFN-γ at 500 U/ml stimulated the bactericidal activity of THP-1 monocytes (Fig. 7⇓, A and B). Thus, as observed for cell death, IFN-γ-induced C. burnetii killing was dependent on mTNF but not on soluble TNF. The alteration of homotypic adherence had profound consequences on the bactericidal activity of IFN-γ. First, we assessed the effect of mechanical dissociation on monocyte infection (Fig. 7⇓C). In the absence of IFN-γ treatment, the relative infection index was 270 ± 22 after 3 days (see Fig. 7⇓A); in the presence of IFN-γ it was 68 ± 10. Dissociating cell clusters 1 day (either day 1 or 2) led to a relative infection index of ∼90 (32% increase) while dissociating cell clusters during 2 days increased the relative infection index by 63% (111 ± 9, p < 0.05 compared with undissociated cells). Second, C. burnetii killing was also reduced by blocking anti-β2 integrin Abs or antisense treatment (Fig. 7⇓D). The relative infection index, which was 67 ± 5 in the presence of isotypic IgG increased to 111 ± 28 (p < 0.05) after the anti-CD11b + anti-CD18 + anti-CD54 Abs treatment of monocytes. After treatment with control antisenses, the relative infection index was <45; it increased to 106 ± 9 after AS18 treatment (p < 0.02). These results show that IFN-γ-induced C. burnetii killing requires cell contact-dependent apoptosis of infected monocytes. Role of mTNF and homotypic adherence in IFN-γ-induced C. burnetii killing. Monocytes were infected with C. burnetii for 24 h (designated 0 h) and cultivated for different periods of time. The infection index was assessed after Gimenez staining. 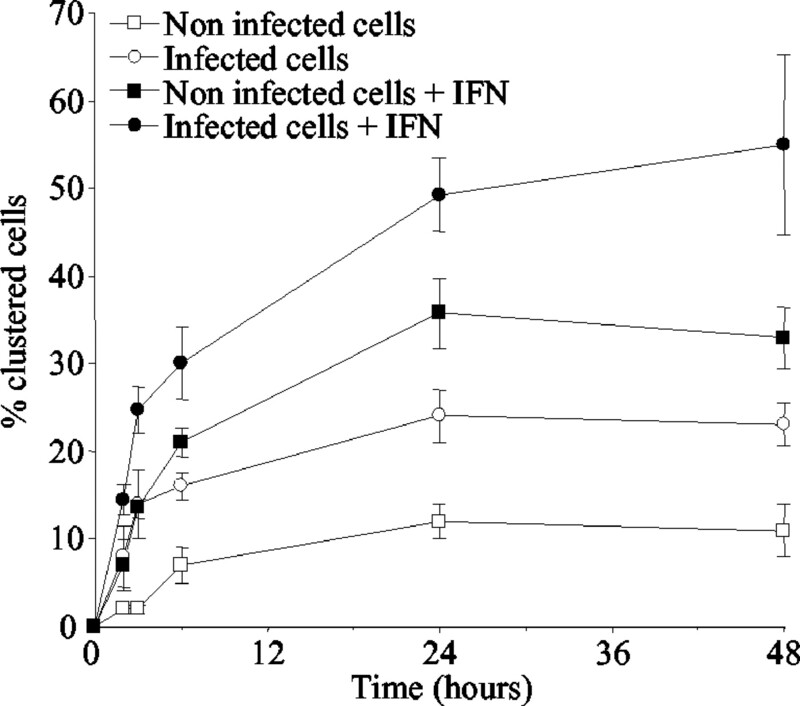 Results are expressed relative to the infection index at 0 h. A and B, The relative infection index (A) and the bacterial viability (B) were determined each 24 h after IFN-γ or TNF was added to infected monocytes at 0 h. C and D, The relative infection index in infected monocytes treated by IFN-γ for 72 h was determined after disruption of cell clusters: C, by pipetting during day 1 (D1) or day 2 (D2) or day 1 + day 2 (D1&D2), (□, unmanipulated cells); D, by incubation with blocking Abs (anti-CD11b + anti-CD18 + anti-CD54, 10 μg/ml each) or antisense treatment. The results are the mean ± SD from four experiments. ∗, p < 0.05; ∗∗, p < 0.02 compared with controls. In this paper, we show that IFN-γ induces monocyte apoptosis and C. burnetii killing through β2 integrin-mediated cell clustering, which allows mTNF to deliver a death signal to infected monocytes. There are several indications that implicate mTNF. Anti-TNF Abs abrogate IFN-γ effects but soluble TNF does not induce apoptosis or bacterial killing in C. burnetii-infected monocytes. Furthermore, mTNF is detected in C. burnetii-infected, but not in uninfected, monocytes treated by IFN-γ. Its expression is transient, which is in agreement with other authors (28). Its contribution to IFN-γ-mediated apoptosis and C. burnetii killing is demonstrated by the inhibitory effect of anti-TNF Abs or the combination of TNFR1 and TNFR2 Abs. In addition, we showed that TNFR1 and TNFR2 are present on C. burnetii-infected monocytes. Previous reports had demonstrated that TNFR2, alone or in synergy with TNFR1, is the receptor of mTNF (29, 30). Despite its lack of death domain, TNFR2 has been implicated in TNF-induced apoptosis (reviewed in Ref. 31). It is thus likely that both TNFR are involved in apoptosis of C. burnetii-infected monocytes and bacterial killing. Thus, IFN-γ-induced apoptosis occurs only in the context of infection when both mTNFR and TNFR are expressed. Homotypic adherence of monocytes is required to induce cell apoptosis and C. burnetii killing. It involves the interaction between CD11b/CD18 (CR3) and CD54 (ICAM-1), a ligand of β2 integrins. The increased adherence of infected monocytes treated by IFN-γ is the result of the up-regulated membrane expression of CD54 whereas CD11b and CD18 expression remains unaltered. The prevention of homotypic adherence of C. burnetii-infected THP-1 monocytes, by specifically targeting the CD11b/CD18/CD54 complex with blocking Abs or with antisense oligonucleotides, restores monocyte viability and increases C. burnetii infection. It should be noted that before antisense treatment, the CD18 molecules have to be removed from cell surface by trypsin/EDTA. Without the latter, existing cell surface CD18 molecules are sufficient to support IFN-γ effects (data not shown). The mechanical dissociation of cell clusters also inhibits apoptosis and C. burnetii killing induced by IFN-γ. The crucial role of IFN-γ in the response against intracellular bacteria infection in vivo is undoubted (21) but, surprisingly, in vitro experiments with human macrophages often failed to demonstrate the microbicidal activity of IFN-γ. For instance, IFN-γ does not inhibit or even sometimes enhances the growth of intracellular bacteria in adherent human macrophages (32, 33, 34). Our results may explain these observations: the adherence to a support reduces the likelihood of homotypic contacts, and thus limits the potency of IFN-γ to induce the cell contact-mediated death of infected cells. Accordingly, we observed that IFN-γ does not induce apoptosis of circulating monocytes made adherent to plastic before infection with C. burnetii and cultured at a cellular density preventing cell-to-cell contacts (data not shown). Our results are consistent with the following model of IFN-γ effect on monocyte apoptosis and C. burnetii killing. IFN-γ stimulates the up-regulation of CD54 and the transient expression of mTNF in C. burnetii-infected monocytes. As a result of CD54 up-regulation, CD54 binding to CD11b/CD18 drives homotypic adherence of infected monocytes. This interaction is not sufficient to stimulate monocyte apoptosis and bacterial killing, but it enables mTNF to interact with TNFRs present at the surface of other infected monocytes thereby triggering a death signal. A few hours later, the following sequence of events is observed: the cells become positive for annexin V staining (9), caspase-3 is activated (Fig. 1⇑), the DNA is cleaved (9), and, finally, the cells die. It is noteworthy that Z-VAD-FMK, a cell-permeable and irreversible inhibitor of caspase-3 activity, inhibited DNA fragmentation assessed by TUNEL assay but did not inhibit IFN-γ-induced death of infected monocytes and C. burnetii killing (data not shown). It is well known that, in the absence of caspase-3 activity, TNF-induced cell death displays a phenotype that is different from apoptosis (35). Whatever the precise mechanism of death of C. burnetii-infected monocytes, it appears that the destruction of infected monocytes causes bacterial killing because the survival strategy of C. burnetii is based on intracellular life in this protective niche. Thus, the IFN-γ-induced death of monocytes infected by strictly intracellular pathogens may confer an advantage for the host by denying the sanctuary for these pathogens. In vivo, the response against intracellular bacteria is associated with the formation of granulomas (36). IFN-γ promotes the formation of granulomas in Mycobacterium bovis infection, leading to the control of bacterial growth (37). Within granulomas, the successful containment of the infection might depend on the close contact of cells allowing the cell contact-dependent apoptosis induced by IFN-γ. The presence of such apoptotic macrophages in lung granulomas of mice infected with Mycobacterium tuberculosis supports this hypothesis (38). The overproduction of inflammatory cytokines observed in the context of chronic Q fever (39) could result, in vivo, in increased adherence of C. burnetii-infected monocytes to the endothelium, as shown in vitro (40). Thus, in patients with chronic Q fever, infected monocytes might escape cell contact-dependent apoptosis induced by IFN-γ by promoting heterotypic interactions with endothelial cells rather than proapo-ptotic homotypic contacts. Moreover, the deficit in IFN-γ production observed in these patients (41) increases the chance for C. burnetii to escape the IFN-γ-induced death of their host cell. Monocytes/macrophages can kill T cells (42), endothelial cells (43), or neutrophils (44) by a mechanism involving cell-to-cell contacts and mTNF. To our knowledge, fratricidal apoptosis of monocytes has only been described as a possible regulatory mechanism of monocyte homeostasis during the immune response (45, 46). In this study, we show for the first time that the fratricidal apoptosis of infected monocytes is an effective antimicrobial mechanism induced by IFN-γ. Additional experiments would be needed to demonstrate whether this mechanism is the mode of action of IFN-γ that limits the occurrence of infections caused by other intracellular bacteria. We thank Zlatko Dembic and Ludvig Munthe for their critical reading of the manuscript. ↵1 This work was supported by a grant from the Programme Hospitalier de Recherche Clinique. ↵3 Abbreviations used in this paper: mTNF, membrane TNF; MFI, mean fluorescence intensity. Enari, M., H. Sakahira, H. Yokoyama, K. Okawa, A. Iwamatsu, and S. Nagata. 1998. A caspase-activated DNase that degrades DNA during apoptosis, and its inhibitor ICAD. [Published erratum appears in 1998 Nature 393:396.] Nature 391:43.